The resolving power of lenses is not infinitely scalable. Hence large image sensors are theoretically capable of greater optical resolution than small sensors. Larger sensors also have larger pixels, which means that they collect more light and give a better signal-to-noise ratio than small sensors. The resolution limiting factor is diffraction. A larger format permits a longer focal length of the lens for a given field of view; and the physical aperture size, for a given illuminating power, is a function of the focal length. When correctly stated, an aperture value should be written as " f/n " (focal length divided by a number). If we consider a 50 mm lens operated at say f/16, the diameter of the aperture is 50/16 = 3.125 mm. If we use a small format digital camera, we might need to use a lens with a focal length of about 10 mm to get the same view as would be obtained with a 50 mm (normal perspective) lens on the 35 mm (36 × 24 mm) format. The 10 mm lens operated at f/16 however will have an aperture diameter of 10/16 = 0.625 mm. This places it at a disadvantage compared to the larger format camera, because light spreads out (diffracts) when it interacts with structures of comparable size to its wavelength. Diffraction is the reason why lenses do not give progressively more resolution as the aperture size is reduced, they give instead a peak in resolution at intermediate apertures, and lose resolution progressively as the aperture becomes smaller. The point is that, for a given field of view (and assuming that the number of pixels is not the limiting factor), a small format camera with its short focal-length lens will start to suffer from loss of resolution due to diffraction at a wider relative aperture than a large format camera with its long focal-length lens, i.e., while both cameras might be operating at the same relative aperture, say f/16, the small format camera will have a physical aperture of (say) 0.6 mm, while the large format camera will have a physical aperture of 3.1 mm. In fact, the diffraction problem is sufficiently pronounced with small-format compact cameras that most are not provided with the facility to use apertures smaller than f/8, whereas 35 mm format, and near-35 mm format digital cameras can be used at apertures as small as f/22 or even f/32 with suitable lenses. Shown below is a list of some of the commonly used sensor formats (some film and tube video camera formats are also given for comparison). The Four Thirds and larger formats are generally suitable for high-quality imaging applications. High resolution lenses are needed in order to realise the capabilities of the full-frame 35 mm format. Crop-frame dSLR sensors are generally referred to as "APS-C", but this is not a format definition because the dimensions vary between manufacturers and sometimes vary between models from the same manufacturer. The absurd inch target-size notation is inherited from the era of TV camera tubes. It refers to the outer diameter of the glass vacuum tube that a given solid-state sensor chip was designed to replace. A 1" vidicon tube had room for a target (i.e., light-senitive area) of about 16 mm diagonal. This gives a conversion factor of 0.63. This arbitrary multiplier is then carried through into the other sizes, most of which never existed as camera tubes (2/3" is a genuine size, used in 1960s Sony Tele-Lookie cameras, but most of the others aren't). So, for example: 1/1.7" is 14.94 mm. Multiply this by 0.63 and we get a sensor diagonal of around 9.4 mm. c = diagonal of the 35 mm stills format / diagonal of the actual format. c = 43.267 / (format diagonal). This means that a 20 mm lens used on the camera gives an angle of coverage that is the same as that of a 20 × 1.587 = 31.7 mm lens on the 35 mm format. Hence, for this particular format size, a 20 mm lens is said to have a 35 mm equivalent focal length of 32 mm. Note (3): The 'Four Thirds' format is specified to give a crop factor of exactly 2 relative to 35 mm film stills. This requires a format diagonal of 21.63 mm. Using the criterion in Note (1) above; the name comes about because the nearest pseudo TV-camera tube size with a convenient-looking fraction is 4/3", i.e., 33.87 mm , giving 33.87 × 0.63 = 21.34 mm (i.e., pretty close to the actual). 1/1.8" Bayer mosaic CCD sensor. Illustration shows a 4M pixel device as used in the Olympus C-4040. Format (imaging area) dimensions: 7.18 × 5.32 mm. 1" Vidicon camera tube (EMI 9677). 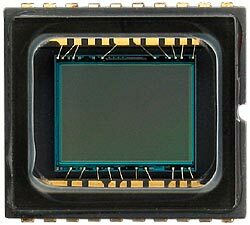 Wikipedia: image sensor format .